Back in the day (pre Mr B), my morning beauty and makeup routine would have been something that you would have expected to see go on backstage of a Victoria's Secret Runway Show (with not quite the same results I must quickly add!). 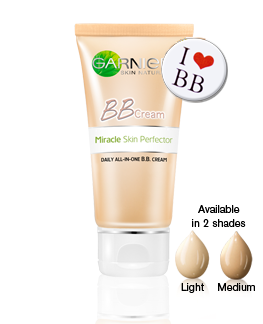 I am seriously in love with this product, it is called 'BB Miracle Skin Perfector' cream and it is by Garnier. Admittedly I was a bit sceptical of this product at first, mainly because it was my Mum that gave it a rave review (and I didn't possibly believe that we would both agree on the same skincare products for our different ages and stages) and secondly because it just sounded and looked way too good to be true! How can a product be a moisturiser, sunscreen and a foundation all in one and only be around the $13 buck mark?! Well it honestly does all of this and more!! I need to be a lot better with my sunscreen with a few age spots creeping in, and this makes it so easy to keep up this essential job, whilst giving my often sleep deprived sallow skin a subtle glow that even Miranda Kerr would envy (okay so I can dream!). Seriously if you have not discovered this, you must give it a try. I am not being sponsored by Garnier, although I should be - this review is about as 'glowing' as your skin will be after you try it! This product is perfect for the busy mum on the go or just if you want to try and simplify your beauty routine - on a budget!! Simply slap it on in place of your morning moisturiser and enjoy the coverage, glow and the fact that your face is protected against the rays. Happy Cheap & Cheerful Tuesday everyone. Tried it? Love it? Hate it? Do you have a must try beauty product? If so I would love to hear what you love to use in your beauty routine that is super cheap and cheerful. A few people have mentioend this to me, and I keep meaning to find it in a shop, but forget when I get there. Is this the same as Garnier Miracle Skin Cream Perfector? It looks the same on the Coles website, but it doesn't have BB on it. You should definitely give it a go!! Yes it is the same thing, I am pretty sure that the image above is just their updated packaging as it looks as though they now have an oil free version too, so they probably updated this at the same time I am guessing. Haha, Marissa you and I are too much alike it is just crazy!! I am so pleased that you tried it and love it too - such a bargain!! I notice that Priceline have it for 20% off this week if you wanted to stock-pile another tube or two?! Love receiving your comments and support.